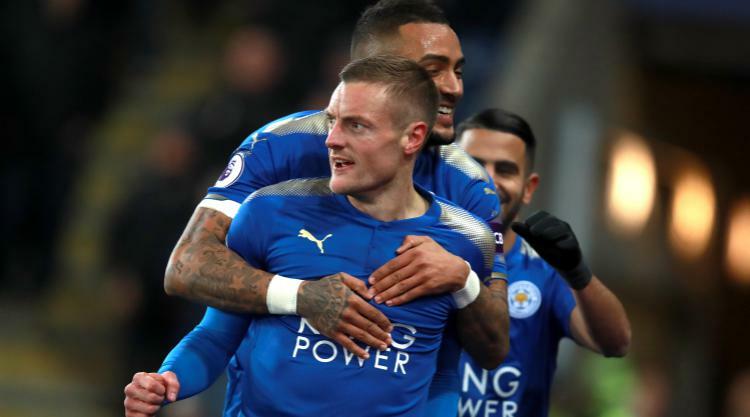 Leicester continue to impress under Claude Puel and the Foxes moved into the top 10 in the Premier League with a 2-1 home win against Tottenham. The usual suspects were on the scoresheet - for both sides. Jamie Vardy gave Leicester an early lead which Riyad Mahrez extended just before half-time. Both goals were of the highest quality. Harry Kane, who had a loan spell at Leicester as part of his development almost five years ago when the Foxes were in the Championship, pulled a goal back late on. It was his 11th in his last 10 matches against his old club. Spurs were unable to rescue a point, though, and any chances they had of mounting another title challenge appear over as they could be 16 points behind leaders Manchester City come this time on Wednesday. Leicester started on the front foot and put Tottenham under some early pressure. Three times in the opening two minutes Leicester tried to get Vardy in behind the Spurs defence but on each occasion the final ball was just lacking. Wilfred Ndidi saw a low strike easily smothered by Hugo Lloris before Leicester captain Wes Morgan, making his 250th appearances for the club, had a header cleared from just in front of the goalline by Danny Rose. Fourth time was a charm for Leicester and the 13th minute was unlucky for Tottenham as Vardy put the hosts ahead. Marc Albrighton this time attempted to get Vardy through on goal and his clipped pass into the area from the left was weighted to perfection and the England striker brilliantly beat Lloris with a controlled first-time volley, deftly touching the ball over the goalkeeper's head. Tottenham were almost level within five minutes as Kane set up Moussa Sissoko, who only had Kasper Schmeichel to beat, but the Leicester goalkeeper did well to block his shot with his legs. The Dane made a similar save just after the half-hour mark to deny Dele Alli. Those misses proved costly as Mahrez doubled the lead just before half-time. The former PFA Player of the Year has been below par this season and was substituted in the draw with West Ham at the weekend, shaking his head and muttering as he slowly trudged off the pitch at the Olympic Stadium. He had been quiet again in this match before he collected the ball out on the right, drifted towards the area and curled a lovely left-foot shot beyond Lloris and into the far top corner of the net. It was a trademark finish from the Algerian. A criticism of Leicester under Puel - this was only his fifth game in charge - has been that his team's second-half performances have not matched that of their first-half displays - and it was the case again on Tuesday night. Shinji Okazaki sent a header over the crossbar early on but Tottenham enjoyed a lot of possession in the second half and gradually stepped up the pressure on the hosts. Christian Eriksen should have pulled a goal back but uncharacteristically skewed his shot well wide from just six yards out. It was his last act and he was replaced in the 77th minute by Erik Lamela, who was making his first appearance in 13 months following two hip operations. Lamela made an immediate impact, sliding a ball down the right side of the area for Kane who finished emphatically with a fiercely-struck shot into the roof of the net. Fellow substitute Fernando Llorente should have equalised three minutes later but somehow poked Serge Aurier's driven cross over the crossbar from inside the six-yard box.